The Cape May ferry is a transportation option for visitors from Washington, Baltimore, Virginia, and Delaware. The ferry brings travelers from Lewis Delaware to Historic Cape May in just 80 minutes. But the ferry is much more than just a transportation vehicle. It can be a real pleasant afternoon boat ride. Many guest rave about sunning themselves on the observation desks and just enjoying the sun and pleasant breezes. A trip back and forth without a vehicle is less expensive then ferrying a car. Many travel to Delaware to check out the outlet stores. Delaware offers some tax breaks on purchases which can be incentive enough for the trip. Many travel to the Cape May terminal to enjoy Cape May Bed and Breakfasts, restaurants,hotels, shopping, birding, and beaches. There are bus shuttles to the center of Cape May and Lewis available at the terminal. Just be sure to check out the ferry schedule for times. The bus shuttle service does have limited hours. 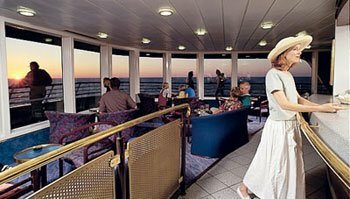 The 80 minute ferry ride doesn’t save much time for most travelers because the driving time to Cape May roughly times out to be the same. What the ferry does do is offer a scenic option that limits the drive time required by the traveler. Many embrace the opportunity to allow someone else to drive for them. In any case if one is traveling to or from places south or west of Cape May you may wish to try the ferry as an option. It can be a very pleasant experience. If you need lodging in Cape May try the Bacchus Inn Bed and Breakfast at 609.884.2129. The ferry does have a limited schedule which changes with the seasons allowing more travelers to cross between Lewis and Cape May. Check out the website listed below for times and rates. This entry was posted on Friday, May 1st, 2009 at 9:37 pm	and is filed under Uncategorized. You can follow any responses to this entry through the RSS 2.0 feed. Both comments and pings are currently closed.